$1.00 off quarts and pints (must mention to receive). 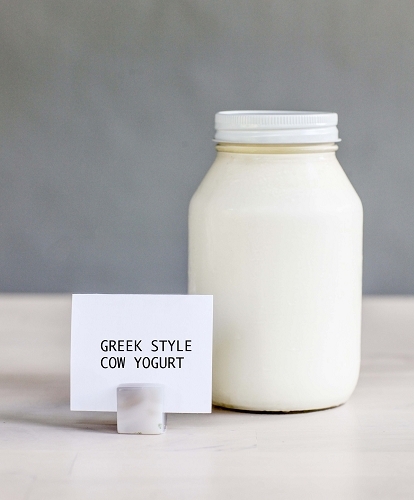 NEW thicker yogurt - GREEK style yogurt! Comes in plain or maple flavor. Comes in plastic container. This fresh milk yogurt is from cows that 100% grassfed. The milk is NOT heated past 90 degrees, thus the enzymes and beneficial bacteria stay in tact. Have you been searching for the perfect tasting yogurt. This is it! The best and only so creamy and naturally sweet. Add mango slices and honey and what a treat. Thank you Miller's farm...!!! Greek Yogurt is supposed to be thick and creamy. Mine was very runny and the container is almost impossible to open without spilling the yogurt everywhere. However, the yogurt was very tasty. I just picked my package up for the 2 weeks and I tried the greek yogurt maple and it was delish!! I am going to get this for sure next order! Immune system and teeth are better! I love this Greek style yogurt. I eat it once a day (I buy 3 quarts every 2 weeks) and notice my immune system is great and my teeth are less sensitive since I've introduced this yogurt into my meals. Thank you!